Learn about real estate, schools and attractions in Mercer Island, Washington! Mercer Island’s natural beauty and woodsy character are reflected in its expansive parks, well maintained athletic fields, and protected open spaces. Boasting 475 acres of parks and open spaces, and more than 50 miles of marked hiking trails, the 30 developed and semi-developed parks offer a wide range of active and passive recreational opportunities—from beach parks, to sport fields, to serene hiking trails and biking pathways. A remarkable array of recreational and cultural opportunities for all ages and abilities abound. Mercer Island’s parks, trails, and recreation facilities offer you and your family—whether residents or visitors—many choices for fun and relaxation! 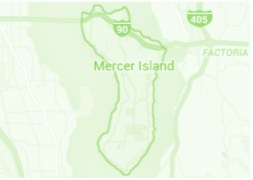 The Mercer Island School District is well known for it’s strong academic reputation. The school district is small, only housing six schools with an approximate student population of 4,000. The district is made up of four elementary, one middle, and one high school and was the Washington Interscholastic Activities Association (WIAA) and Washington Army National Guard 2015-2016 Scholastic Cup Championship awards. The district has held on to these impressive awards for the past 8 years. View art work by regional artists at the Mercer Gallery. The gallery is located at the Mercer Island Community & Event Center, 8236 SE 24th Street. It is open to the public and the exhibits are updated approximately every two months. Artwork is for sale with a percentage of the sales going to support arts and cultural programming of the Mercer Island Arts Council. Find out what’s cooking at Mercer Island’s best restaurants, diners and eateries. No matter what your taste buds are hankering for, you’ll find something to satisfy that craving. Who knew an ear of corn or fresh tomato could improve your health, your community and the environment, all at the same time? Buying local Mercer Island foods is a simple way to do all three. Local food doesn’t suffer the “jet lag” of produce trucked across the country. Also enjoy some of the best shopping experiences Island living has to offer. Small boutiques and interesting storefronts line the streets along with delicious bakeries and pubs that will keep you energized along the way.